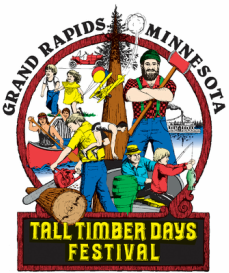 We wish to extend an invitation to sell your artwork during the Tall Timber Days Festival. The Arts and Crafts Fair is set up on the grounds of the Old Central School in historic downtown Grand Rapids, Minnesota. This is a professional, juried show. Please fill in ALL of the information on the form below. Forms are processed and sites will be given on a first come first served basis. I acknowledge that all items displayed and sold from my site will be created by me, demonstrating my talents, skills and time as a crafter (unless selected as a direct seller). I know that I must display and sell from the area assigned to me only. I agree to indemnify and hold harmless the Tall Timber Days Committee, agents and assigns, the City of Grand Rapids, Minnesota, and the craft show promoters from all losses, claims or liability that may arise as a result of my entry to this craft show.